Gili 'T' (Trawangan) in Indonesia is one of the most popular dive destinations in Asia. Thousands upon thousands of divers flock there every year, mostly to do scuba courses and extend their knowledge and training. So of course, Girls that Scuba wanted to see what all the fuss was about and headed to Gili T, Indonesia in summer (2017) and May 2018, to check out the waters ourselves. Here's everything you need to know about scuba diving in Gili T! 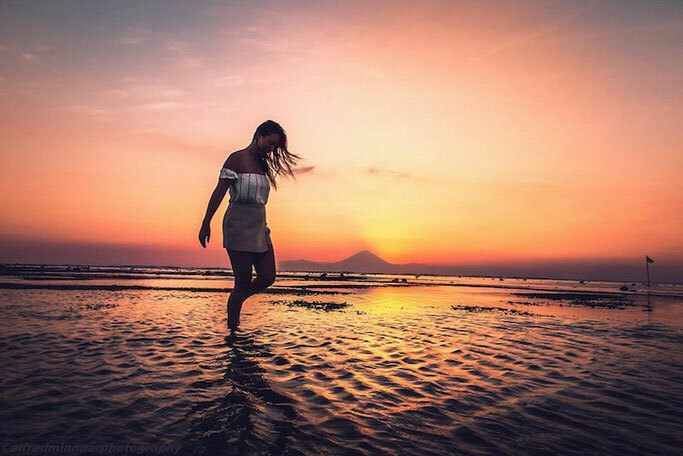 The Gili Islands are an archipelago of three small islands; Gili Trawangan, Gili Meno and Gili Air, just off the northwest coast of Lombok, Indonesia. The islands are a popular destination for tourists. Each island has several small resorts, usually consisting of a collection of huts for tourists, a small pool and restaurant. Most local inhabitants live on Trawangan in a township stretching along its east side just inland (which is also where most recent development is taking place). Automobiles and motorised traffic are prohibited on the islands by local ordinance, so the preferred method of transportation is by foot and bicycle or the horse-drawn carriage called a cidomo. The most convenient way from Bali is by fast boat. There are several companies offering this service throughout the day, although most leave in the morning. Expect the journey door to door to take around 3 1/2 - 4 hours. Manta has to be our favourite dive centre on Gili T!! We just LOVE it there! So where do we start? The staff have to come first; super friendly, attentive, knowledgable and driven. Each one of them loves there job, and it shows! What attracts most people to Manta Dive straight off is their huge open social area buzzing with excitement. Whether it be divers setting up for their dives, friends enjoying a beer after a dive, or new Open Water students laughing in the pool. Once on the boat you needn't worry about much more than doing your safety checks and looking forward to your dive. Your gear is looked after, the instructors are constantly watching for mistakes and the captain is carefully navigating his boat to the dive site. Manta is a great place to do any of your scuba courses - and the Divemaster course is a particularly popular one with the opportunity to become a part of the manta crew! We completed our Sidemount course there with Tech Instructor Phil Christoff ( you're going to want to follow him on Instagram) with 2 other GTS girls and loved every minuet! The TDI Side-mount course is a technically focused course teaching the use of two main side mounted tanks. For technical divers, sidemount allows for diving in areas with limited access to twins tank set up and is ideal for divers. We were newly converted tech divers after Phil's amazing course and knowledge! We can't really praise Manta Dive enough - they sure know how to run a dive centre, and we are proud to offer for sale our Girls that Scuba mask straps in their store - the only place in Indonesia you can buy our straps! That's how much we love 'em! We found TDC on our latest visit as we hadn't had the time to go down and dive with them before. Now, these guys are A LOT of fun! Here's where you want to be heading for a guaranteed good time, alongside some amazing scuba dive instructors and knowledgeable staff. TDC is home to Holly Macleod Multi Award Winning Platinum PADI IDC Course Director - aka the main lady to teach you to become a scuba dive instructor! Then there are some awesome technical instructors (Samuel Mason) if you are looking to go that bit further in your scuba journey! 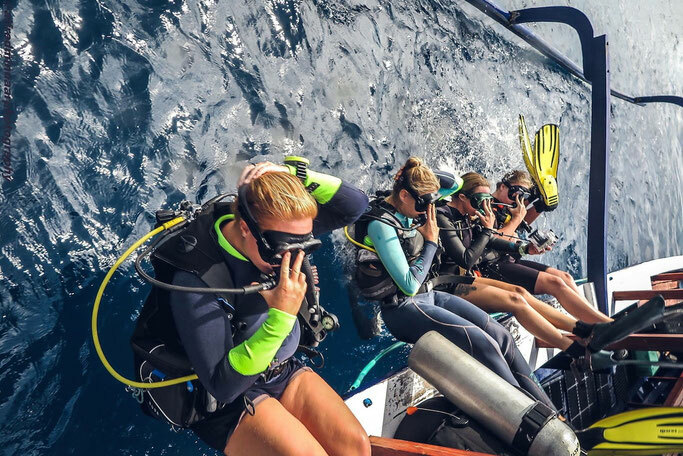 Girls that Scuba recently went over to try and new kind of diving with them - Rebreather diving - read all about that here. Blue Marlin is the largest dive company in Indonesia, with 5 locations around Indo! Most definitely the most talked about dive centre, always brimming with guests and courses going on almost 365 days a year! Their staff really do deserve a pay rise ;). Blue Marlin Dive began in the early 1990’s off the coasts of Lombok, Indonesia in Gili Trawangan by (now!) famed technical diver and PADI Course Director, Simon Liddiard. At the time, there were no dive centres on the island and the “Blue Marlin Dive” that you know and love consisted of just a few sets of gear and one instructor. It quickly developed into a professional and reputable dive centre that thousands of divers a year qualify with. Also home to Blue Marlin Tech, headed by one of the only female tech instructors in Asia, Theresia Gollner - here's the place you want to head if you want to become a Girl that Tech Dives's (yes, we even have a group for those of us obsessed with Tech, that Theresia is an admin for). We did our intro to twin sets with Theresia at Blue Marlin Tech and learnt so much - we'd definitely recommend any GTS girls who want to learn more about twin sets to head over and see Theresia! She's been a part of Girls that Scuba for a long time now, and if anything will make a great friend on the island (follow her on Instagram @bluemarlindivetech!). So you've chosen your dive centre? Awesome, now, where do you want to dive? Most dive centres will recommend for you based on your level, but there are a few dive sites you can't miss while diving on Gili T! One of the most varied and interesting dive sites around the Gili’s, Shark Point is a vast open site available to all levels of diver certification. The site starts with a shallow sloping reef, with a series of ridges and valleys leading into deeper water. A steep slope on the north side of Gili Trawangan, from 5m down to 24m with a series of gullies at the bottom. A fine site to multi level dive, the selection of soft coral in the deeper section gives way to hard corals as you ascend and in the shallows there are always several turtles totally unfazed by the presence of divers. This is also a great site for drift dives. Advanced Certification Required - currents can get strong. If there's anything big swimming around the islands, you can find it here! The current is the most difficult item to manage here: it drfits at a right angle to the reef, so you're often against it or to its side. As a deep site it is less dived than others, more accessible; the coral is in great shape and pelagic life hanging around can be surprising. Meno wall, off the west coast of Gili Meno, goes down to depths of 18m. It offers a lot of small coral fish like Lionfish, Soldier Fish, Gobies, crabs, as well as Wart Slugs and Nudibranches coming out of hiding. It is also called "Turtle Heaven" because of the many resident Hawksbill and Green Turtles - this is where you wanna go if you want those awesome turtle pictures! But there's diving in Gili islands then there is diving in Komodo!! If you get the chance we HIGHLY recommend you getting a flight over there! 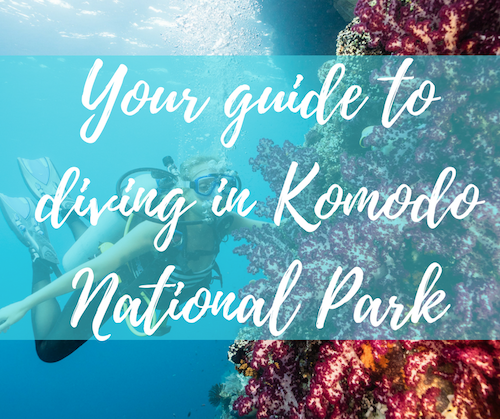 Read more about scuba diving in Komodo here. ✨ She believed she could, so she did ✨ #girlsthatscuba ••••••••••••••••••••••••••••••••••••••••••••••••📸 @alfredminnaarphotography 📍 @bluemarlingilit #Indonesia 🙆🏻 ft 17 GIRLS THAT SCUBA •••••••••••••••••••••••••••••••••••••••••••••••••Together, we created a movement, we smashed stereotypes, we shook up the industry. 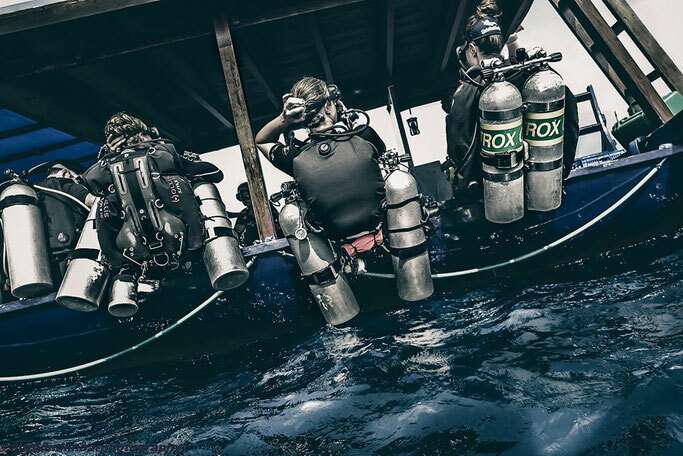 Together we created the largest female scuba community in the world. Together we are stronger. Thank you to the 17 mermaids that turned up to dive with us today, and to the 11,200 other GTS members (plus 26,000 of you on IG) for supporting us all over the globe. It's just the beginning. Built among the palm trees of Gili Trawangan, the treehouses offer adventurous travellers a unique experience. Stay in your own private treehouse and get back to your roots in this perfect luxury glamping getaway. Top end budget on Gili T, starting at around £175 a night in low season. We stayed here while doing our sidemount course as we needed a bit of peace and quite to study and rest. Located in the middle of the island, it's a nice bike ride away from the main strip and starts your morning off right. HUGE private room, pool and breakfast will set you back £15 a night in low season! Cheap and cheerful, if you're on a budget, this is where you'll want to be! £7 a night! Pesona has it all in one place, so you really never have to leave - and I hardly did. Boasting the best Indian restaurant on the island, an amazing spa and some cute rooms, I'd definitely recommend those who haven't got a villa budget to stay here. Ever since we visited Gili T and shared our experience on social media everyone is asking how they can get the pictures we did, and we make sure to tell them we can't take any credit at all from them! The magic is all down to a certain Alfre Minnaar Photography - our friend Alfie from Manta Dive! 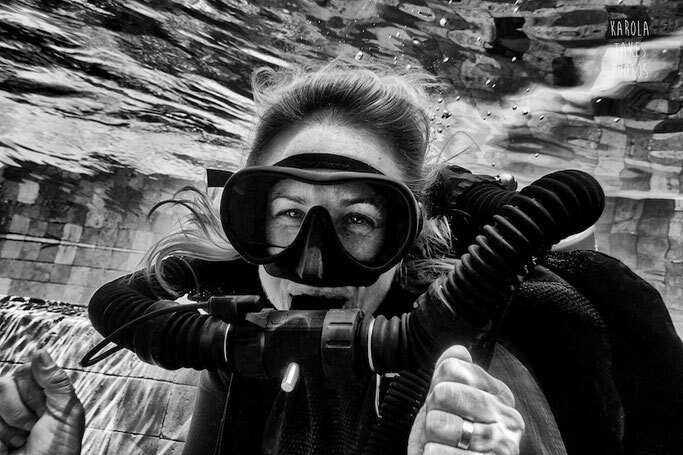 His unique style of photographing divers is unseen anywhere else in the world. Capturing their emotions before, during and after a dive in his creative style makes his photography extremely sought after. If you are looking to have some portraits like this just hit him up on Instagram and make sure you tag @girlsthatscuba when you get them! Share this guide to diving in Gili T with everyone you know!